Integrating the first eight-speed automatic transmission in a domestic luxury sedan, the new 2012 Chrysler 300 series sedans offer world-class technological innovation and quality while delivering stylistic distinction and premium E-segment sedan features at a legendary value. Once limited to premium import vehicles costing twice as much, the new segment-exclusive ZF 8HP45 eight-speed automatic transmission expands the world-class power and fuel-efficiency of the 2012 Chrysler 300, 300S (V-6) and 300 Limited models. The addition of three more gear ratios in the proven transmission design help to reduce the gaps normally associated with upshifting and downshifting. Combined with the award-winning 292 horsepower 3.6-liter Pentastar V-6 engine, passengers will experience world-class levels of refinement due to small, evenly spaced ratios that provide quicker acceleration and smoother shifts. Quicker shifts are possible as a result of a “Sport” shift mode that requires simple driver input. When the driver chooses to let the transmission shift in Sport mode, gear changes are quicker and revs are held higher for even more performance-oriented acceleration and higher shift dynamics. For even more control on the new Chrysler 300S models, the driver can also use a pair of die-cast steering-wheel mounted paddle controls and view gear selection through an all-new full-color EVIC centered in the Chrysler 300S’s instrument cluster. Delivering improved fuel economy compared with the previous generation six-cylinder Chrysler 300 AWD models, the new 2012 Chrysler 300 Limited and 300S (V-6) AWD models combine the new eight-speed automatic transmission, fuel-efficient 3.6-liter Pentastar V-6 engine and the segment’s most advanced AWD system for maximum all-weather traction and efficiency. Chrysler 300’s AWD system features a segment-exclusive active transfer case and front-axle-disconnect system to improve real-world fuel economy by up to 5 percent. No other major automotive manufacturer offers the combination of these two independent technologies. Chrysler 300’s innovative AWD system seamlessly transitions between rear-wheel drive and AWD with no driver intervention. When all-wheel drive is not required, the system automatically disconnects the front axle to maximize fuel economy while still providing the outstanding fun-to-drive performance and handling inherent in rear-wheel-drive vehicles. With the introduction of AWD on the new Pentastar V-6 powered 2012 Chrysler 300 models, Chrysler engineers took the second-generation E-segment architecture further with the addition of new hydrobushings for even more world-class refinement. Compared to the previous generation, new 2012 Chrysler 300 models with AWD features a 0.5 inch (13 mm) tighter tire-to-fender fitment, a 0.15 inch (4 mm) lowered overall ride height and larger 19-inch wheels with wider P235/55R19 All-Season performance tires. Originally revealed on the all-new 2012 Chrysler 300S models, the industry-first partnership between Chrysler and Beats By Dr. Dre is now expanding the studio quality sound experience of Beats by Dr. Dre technology into more Chrysler 300 models, including the 300 Limited, 300C and new 300C Executive Series. The unique partnership between Chrysler and Beats By Dr. Dre brings the music studio to consumers in cars not just by adding speakers, but working the music makers themselves to reproduce sound the way that it’s made in the studio. Instead of the traditional approach to automotive sound entrusting lab coat-adorned engineers as the arbiters of musical taste, Beats by Dr. Dre founders Dr. Dre and Jimmy Iovine worked side-by-side with the engineering team at Chrysler to design and tune the 10-speaker audio system. Standard on 2012 Chrysler 300S models, and available on 2012 Chrysler 300 Limited, 300C and 300C Executive Series models, the Beats by Dr. Dre audio technology includes a 522-watt 12-channel amplifier that integrates the heart of the Beats proprietary equalizer algorithm, creating the high-definition sound required in professional recording studios. Delivering the mid- to high-range needed for studio-quality sound are three 3.5-inch speakers located in the instrument panel and two 3.5-inch speakers located in the rear doors. Two 6 x 9-inch front-door woofers provide bass, while two 6 x 9-inch speakers and a center-mounted 8-inch speaker located in the rear-shelf area provide full-range audio. Maximizing how music genres from hip hop to Motown should sound and feel, an 8-inch Beats Audio trunk-mounted dual-voice coil subwoofer with sealed enclosure delivers tight, powerful, punchy bass. The new 2012 Chrysler 300 sedan’s Uconnect Touch system has been upgraded for 2012, adding hands-free texting, voice commands for Garmin navigation, SIRIUS Traffic, and more iPod® control features to expand on the system’s world-class infotainment, connectivity and convenience technologies. For the Chrysler brand, safety is a priority and the upgraded Uconnect Touch 8.4 and 8.4N models with hands-free texting, keep passengers even more connected through voice commands. With a compatible Bluetooth phone, Uconnect Touch enables text-to-speech for incoming text messages, and provides the driver with ‘canned’ speech-to-text responses for outgoing messages. With the segment’s largest touchscreen display (8.4-inch), the easy to use Uconnect Touch 8.4N with integrated Garmin® navigation is even better with the addition of voice recognition and SIRIUS Traffic. With natural voice commands, the Uconnect Touch 8.4N enables Chrysler 300 passengers to input street addresses and navigate to points of interest. And with the addition of SIRIUS Traffic, real-time traffic monitoring notifies the driver or enables the Garmin navigation to reroute due to congested throughways. Adding an avant-garde appearance to the letter-series flagship sedans, the all-new Chrysler 300S V-6 and V-8 models take the American brand in a new direction with world-class ride and handling, discrete exterior styling elements, contemporary interior materials and state-of-the-art technology features. With larger 20-inch polished-face aluminum wheels with black painted pockets, all-season performance tires, touring-tuned (performance-tuned with HEMI® V-8 engine) second-generation E-segment chassis architecture with 25 percent quicker steering and 20 percent heavier on-center feel than the entry-level 300 model, the all-new Chrysler 300S V-6 and V-8 models are engineered for driving enjoyment. Hinting that this Chrysler sedan was born with attitude and street-cred – unique body-color fascia accents and mirrors, and black-accented headlamp bezels with matching sculpted horizontal grille blades in black chrome replace bright chrome to give the 2012 Chrysler 300S a low-key street presence. The interior of Chrysler 300S models exude an athletic-luxury theme with 12-way power driver and passenger front seats with large-bolstered and heated monotone cloth sport seats surrounded by an interior environment in black. Exclusive use of Piano Black on interior center stack, instrument panel, steering wheel, gauge cluster and door panel elements provide a uniquely lacquered and highly detailed appearance. Completing the enthusiast-designed interior are matte carbon hydrographic finished accents, replacing traditional burl wood. State-of-the-art Uconnect Touch 8.4 provides 2012 Chrysler 300S passengers with the segment’s largest touchscreen display (8.4-inch) and next-generation mobile infotainment, connectivity and multimedia features. Uconnect Touch also controls the high-performance 10-speaker Beats Audio system with 522-watt 12-channel amplifier for high-definition sound. The 2012 Chrysler 300S V-6 model features the aluminum 3.6-liter Pentastar engine delivering 292 best-in-class 6-cylinder horsepower through an all-new segment-exclusive ZF eight-speed automatic transmission. For even more spirited driving with performance feel, the driver can utilize all-new steering-wheel mounted paddle shifters to manually select the desired gear. When equipped with the optional Luxury Group, the Chrysler 300S V-6 includes premium Nappa leather sport seating in black or exclusive Radar Red, memory module that stores position of the driver seat, exterior mirror, steering wheel, pedal and radio for two drivers, heated rear seats, heated and leather-wrapped steering wheel, power tilt and telescoping steering column, power-adjustable pedals, power sunshade, vehicle security alarm, driver’s side auto-dimming mirrors and auto-tilt in Reverse, heated/cooled cup holders, trunk mat, satin chrome lower door sills with “Chrysler” logo, and LED illuminated front-footwells and front and rear map pockets. V-8 delivers world-class power and refinement with enthusiast-tuned handling. In addition to the features included on the Chrysler 300S V-6 with Luxury Group, the eight-cylinder 300S model adds 160-mph LED-illuminated instrument cluster, rain-sensing windshield wipers, Smartbeam headlamps, ParkView® rear back-up camera, and HomeLink universal transceiver. Providing additional all-season confidence, the Chrysler 300S V-6 and V-8 all-wheel-drive (AWD) models utilize 19-inch polished-face aluminum wheels with black painted pockets, P235/55R19 all-season performance tires and the segment-exclusive active transfer case and front-axle disconnect AWD system. 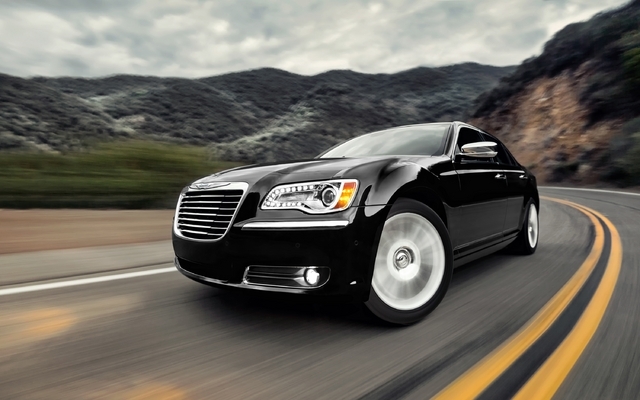 The 2012 Chrysler 300S letter-series models arrive at Chrysler dealerships in the fall of 2011. Designed to be the most luxurious Chrysler flagship sedan ever, the all-new Chrysler 300C Executive Series combines ultra-premium leather – once limited to some of the most exotic Italian luxury cars – with world-class refinement and handling, state-of-the-art safety and connectivity features and the legendary 363 horsepower 5.7-liter HEMI V-8 engine with Fuel Saver Technology. Exclusive features found on the Chrysler 300C Executive Series interior include either Mochachino or Black Poltrona Frau® “Foligno” leather-wrapped instrument panel, cluster brow, center console side panels and upper front- and rear-door panels. Premium Nappa leather covers the door armrest, bolster and center console armrest. Two-tone Mochachino or Black seats are wrapped exclusively in supple Nappa leather and include 12-way power-adjustable driver and front-passenger seats (including four-way power lumbar) with two-mode ventilation and two-mode heated seats for both front and rear passengers. Specially selected Natural Pore Mocha or Pore Gray real wood trim is finished in a low-gloss to enhance the beauty of the wood. On the exterior, the Chrysler luxury flagship replaces chromed fascia, mirror and door handle accents with a unique platinum chrome finish for an even more upscale look. Topping off the unique exterior is a platinum-chrome finished grille surround with platinum-chrome mesh grille for a truly distinctive appearance (late availability). Premium interior amenities within the Chrysler 300C Executive Series model include the state-of-the-art Uconnect Touch 8.4N with Garmin navigation, SIRIUS Traffic and SIRIUS Travel Link, 160-mph LED-illuminated instrument cluster with driver-selectable color EVIC, heated and leather-wrapped steering wheel, power tilt and telescoping steering column with memory, power-adjustable pedals with memory, power backlight sunshade, premium 18-ounce Berber floor mats with Nubuck trim, satin chrome lower door sills with “Chrysler” logo, dual heated/cooled cup holders, ambient lit foot well lighting, LED illuminated interior door handles and front and rear map pockets, premium carpeted trunk mat, HomeLink universal transceiver and power-folding chromed exterior mirrors with memory, auto-dimming and auto-tilt in Reverse. Available in rear-wheel drive or with the segment’s most advanced AWD system, the 2012 Chrysler 300C Executive Series models arrive at Chrysler dealerships in the fall of 2011. The new Chrysler 300 was named a Top Safety Picks by the Insurance Institute for Highway Safety (IIHS), achieved their highest rating. IIHS recognizes vehicles with outstanding crashworthiness in front, side, rollover and rear crashes. The new Chrysler flagship received ‘good’ ratings, the highest achievable, in all four categories. To be considered, vehicles must have available electronic stability control (ESC) systems that significantly reduce crash risks. Chrysler 300 has standard ESC. Other standard safety features including full-length side curtain airbags, seat-mounted side thorax air bags, driver’s knee bag, front-row reactive head restraints, Hill-start Assist, Rain Brake Support and Ready Alert Braking.